A special presentation will take place at 12:30 p.m. Tuesday, Nov. 7 in the Friends Corner of Lovejoy Library. All members of the campus community and the general public are invited to attend. During the program, the Venerable will describe the challenges and rewards of assembling the all-encompassing set of reference books. She will answer questions following her remarks, and the encyclopedia set will be available for immediate use in the Library. “This set will impact Asian studies, history, art and design in its various forms – sculptures, paintings, architecture – as well as philosophy, sustainability and religious studies,” Lovejoy Library Fine Arts Librarian Therese Dickman said. 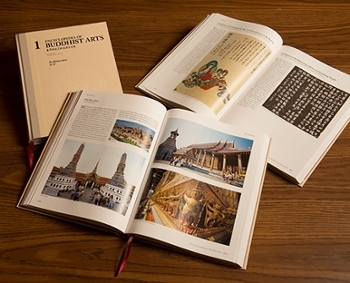 The donation includes the first comprehensive set of books about Buddhist art worldwide, and Lovejoy Library is receiving the eighth such set in the English language. The encyclopedia set comprises four volumes on Buddhist architecture, five on grottoes, four on Buddhist sculpture, three on painting, one on crafts, and one each on calligraphy, seals and biographies. 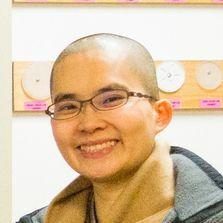 Min Liu, PhD, associate professor in the Department of Applied Communication Studies and member of the Fo Guang Shan St. Louis Buddhist Center, was instrumental in acquiring this culturally diverse donation. Light, vegan refreshments and hot tea will be provided at the Nov. 7 program. Questions may be directed to Jeff Brown, director of development for Lovejoy Library, at jefbrow@siue.edu or 618-650-2714. The event is sponsored by The Friends of Lovejoy Library and The SIUE Foundation. The Encyclopedia of Buddhist Arts will be presented to SIUE’s Lovejoy Library during a special program being held Tuesday, Nov. 7.